I had come from winery visits in Slovenia and Slovakia and had been drinking nothing but white wines, so I was really in the mood for a red wine with my beef, and was thinking Bläufrankisch. My spy friend said that the waiter recommended a glass of white for him, but he preferred a beer. "The beef is really mild," he said. "A red wine might overpower it." 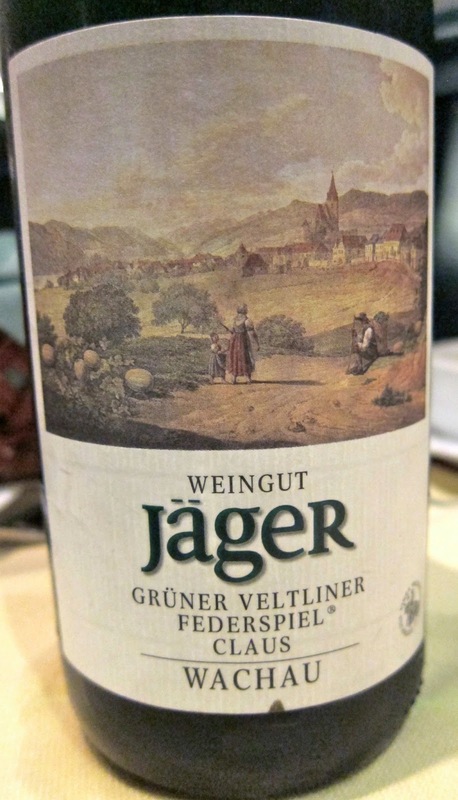 I asked the waiter which wine he recommended, and he said the Jäger Federspiel Grüner Veltliner. I asked why that one (they had 10 or so Grüners on the list of more than 100 wines), and he said, "That's the one." I asked what it tasted like, and he said, "It's perfect." My spy friend and I smiled together. What the hell, it was only 31 Euros, far from the most expensive, so I ordered it. And you know what? It was perfect. Austria has never been great terroir for red wines, but they've been making world-class white wines for centuries. Tafelspitz is a great example of how food and wine culture develop in parallel. 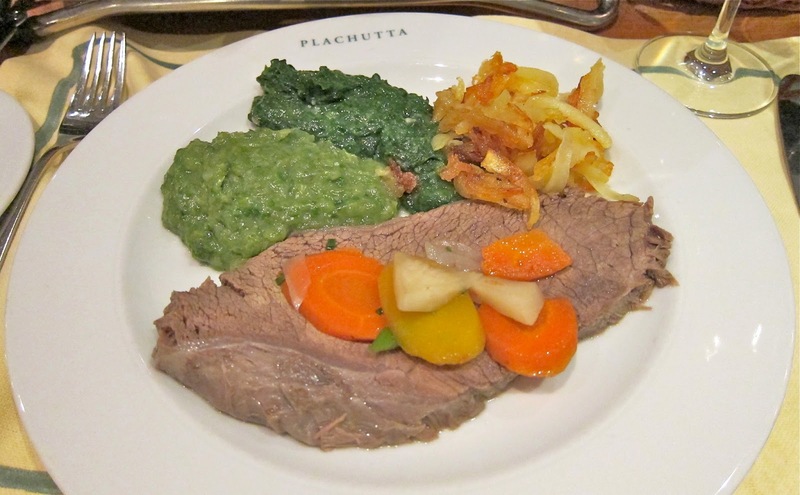 The Austrians take beef, the classic red-wine food, and turn it into white-wine food. Boiled beef has very little flavor; most of the beef flavor goes out into the broth with which you start the meal, and the Grüner is refreshing with that. What you're left with is tender, nearly flavorless sirloin. This ends up being more delicious than you'd think. I spooned broth onto the beef to give it some of its flavor back and added a little enhancement to every bite: fried potato rosti, creamed spinach, chard, applesauce with horseradish. All of that stuff is white wine friendly. You spread the marrow on some toasted rye bread, sprinkle salt and pepper on it, and enjoy its soft richness. And then, more Grüner Veltliner. I enjoyed the heck out of this meal, taking a bite of this, a dab of that. I also drank an entire bottle of Grüner Veltliner almost by myself. I gave my spy friend a glass just to try to convince him that white wines have merit, but he still didn't give up any details about resettled KGB sleeper agents. He agreed that it was perfect with the beef, more so than his beer, which he revealed had also been described as perfect. As any Wine Advocate reader knows, there are clearly varying degrees of perfection. 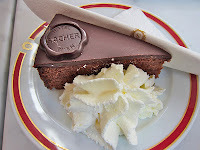 The next day I still felt full of beef and decided to have a healthy lunch of Sacher Torte and heavily creamed coffee. The Original Sacher Torte is a beautiful piece of cake: I love the way the name is stamped in chocolate onto every slice. But this confection is coasting on its reputation. The cake was dry and uninteresting. The layer of apricot jam was not enough to remedy it, and while the dark chocolate topping was good, how hard is it to frost a cake in good dark chocolate? You pay a premium to eat The Original Sacher Torte so the next time I'm in Vienna, I will accept imitations. In fact, later that day I was hungry and wanted more coffee, so I went to Cafe Prückel and had a bowl of krautsuppe and a piece of apple/poppyseed strudel. The latter was the most delicious thing I had in Vienna: fresh, moist, fruity, with plenty of mildly nutty poppyseed flavor. 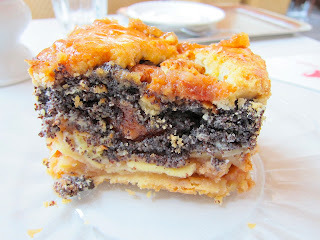 Many poppyseed pastries are dry; the apple was a great addition. This left just one item on my checklist: wiener schnitzel. My friend Robert Whitley, publisher of Wine Review Online, was amazed that I had made it through life without trying it, so we went to Plachuttas Gasthaus zur Oper, within site of the Vienna State Opera. Whitley and his wife had been the night before and assured me that this was the place. He also assured me, when I got my wiener schnitzel, that it was as it is supposed to be: it wasn't corked or oxidized or otherwise tainted. It tastes like fried breading. Meh. I tried spritzing some lemon on it, and then it tasted like fried breading with lemon. The veal has practically no flavor at all. I confess I'm not a fried food fan. About the only things I like deep-fried are soft-shell crabs, oysters (though I prefer them raw), and potatoes (of course). I rarely even eat fried chicken. But if I had to choose, I'd go for fried chicken over wiener schnitzel any day. At least that has spices. 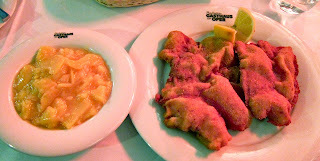 Fortunately the wiener schnitzel came with delicious warm potato salad. I got bored with the empty calories of fried breading and stopped eating it, but I polished off all of my potato salad and about half of Robert's. There's a reason the veal is relatively flavorless: Grüner Veltliner goes very well with this dish too. The salty, crunchy breading brings out the fruitiness in the wine. 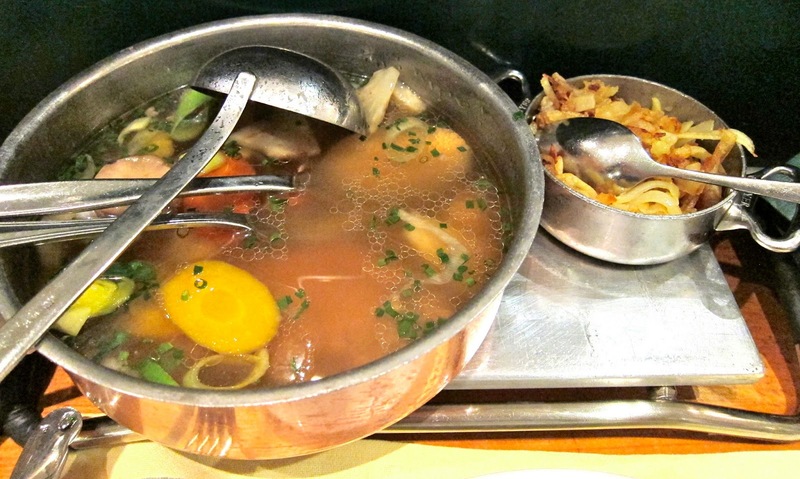 I went to Vienna to try the culinary trinity, and discovered it was actually a foursome. Deep friend foods need, at the very least, to offer something texturally to hold on to. A flat piece of mild meat, does not offer that.